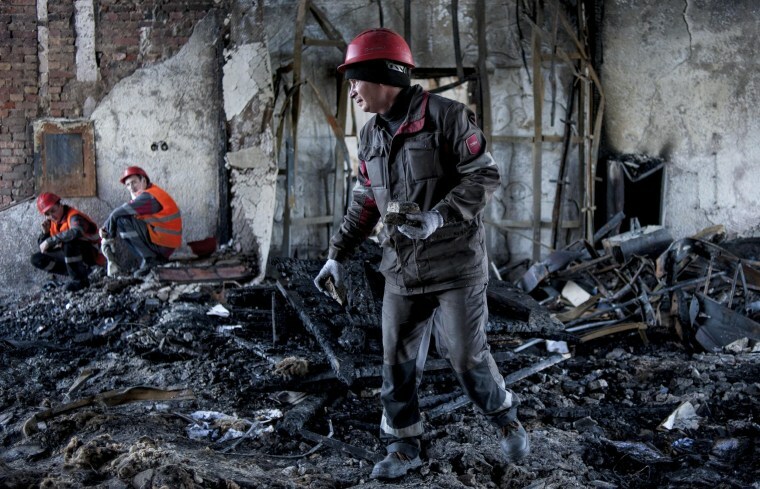 Workers of the Ukrainian company Metinvest cleared away debris in government buildings in the eastern Ukrainian city of Mariupol on Friday. Local patrols by steelworkers have forced pro-Russia insurgents to retreat from the government buildings they had seized, giving residents hope that a wave of anarchy was over. Mariupol is the second-largest city in Ukraine's eastern Donetsk region, one of two regions that declared independence on Monday from the central government in Kiev. Citizen patrols began there earlier this week as Rinat Akhmetov, Ukraine's richest man, urged steelworkers at his factories to help police restore order.